When we moved into this house in 2003, I bought a weed-eater. The British would call it a strimmer. In French, it's called une débroussailleuse. 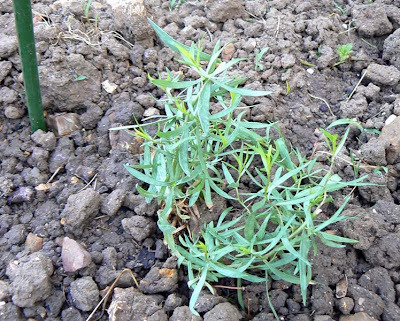 Estragon, or tarragon. One of two plants this year. It's a big model, heavy, with a two-stroke engine, bad for the environment. But our half-acre was covered in two-foot high weeds and we needed something to tackle that. So we bought the big boy. It worked great for us. The weeds got whacked and the yard has been under control since. But using this big honking weed whacker for weekly trimming is next to impossible. 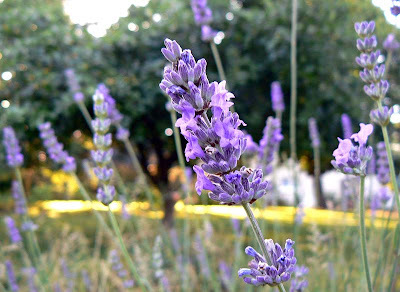 Lavender in the herb garden. First, and foremost, there is the string. The nylon cord that actually cuts the weeds ran out. I have tried and tried and tried, but I cannot wind the replacement cord onto the spindle in a way that makes it work. In other words, once the cord is used, one is supposed to be able to tap the spindle on the ground and new cord should unwind automatically, be cut by the handy little cutter blade, and away you go. 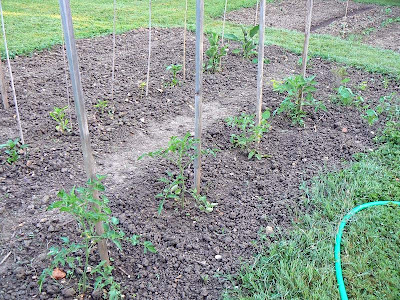 Tomatoes, peppers, and eggplant, just starting out. But no. Once the factory-installed cord ran out, I did my best to replenish it, but it just will not work. Plus, the darned thing is too big and heavy to do the normal yard trimming I have to do. Add to that that I have to buy two-stroke oil and mix oil and gas to fuel it. Yuck. 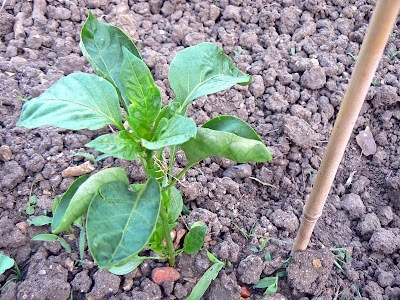 A red bell pepper plant. Long may it grow! I got it out this weekend and re-wound the string. 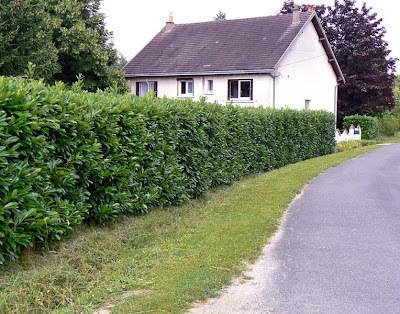 I started it up and did some weed whacking in the herb garden, and out on the side of the road along our hedge, where the weeds had gotten pretty thick. It was a pain, but it worked. But the string still won't self-feed. The weedless roadside, after. I didn't think to take a "before" shot. We're thinking of getting ourselves a smaller, lighter, electric model for everyday use. Well, not every day, but you know what I mean. 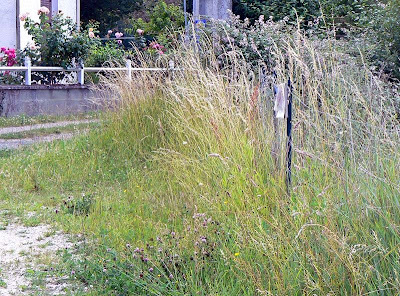 This is what the weeds looked like before, only next to the hedge. I'm certain the neighbors are sighing, finally, he cut those darned weeds. Confused? We have a well in our back yard. It's not a real well, just decorative. But it looks like it could have been real. And it's not old, less than forty years, we reckon (yeah, I said reckon. That's what happens when you live with a southerner). What the well looks like today. When we bought the house, I pulled all the overgrown saxifrage out of the well and planted three small lavender plants. They grew up into huge clumps, and they weren't really all that nice. So this spring I relocated the lavender to a place along a south-facing wall, where I think they'll be much happier. 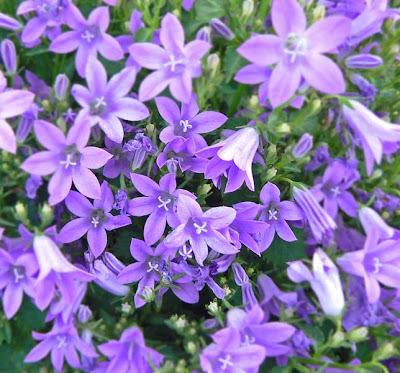 A close-up of campanules in flower. 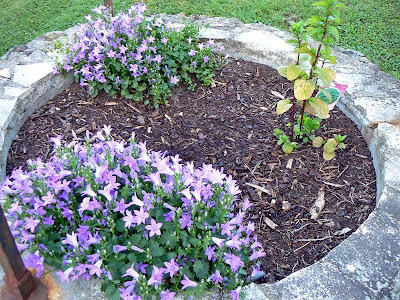 I planted campanule (bellflower) cuttings in the well from the parent plants out front, and they adjusted pretty quickly to their new home. I also got a mint plant and added it to the well. 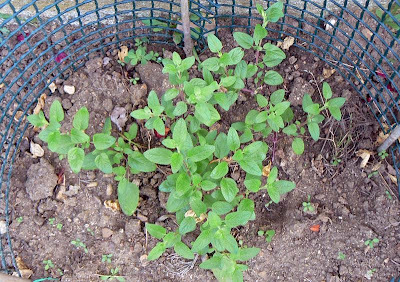 I suppose that the mint will eventually take over and fill the well. In the meantime, I put a few parsley seeds in the middle and we'll see how they do. So that's the story of the new, old, real, fake well. Speaking of mint, when we were on the island in May, I pinched some cuttings of what we think is bergamot (monarda fistulosa or didyma). They rooted very easily in water and we planted them against the southern wall of the house. They're looking pretty good so far. If they do well, they should have bright red flowers on them next spring. That's French for artichokes. 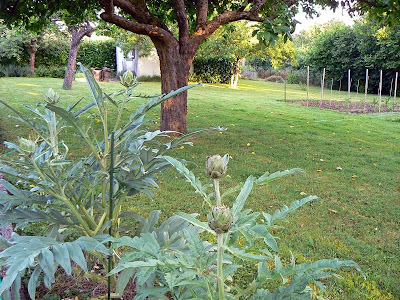 Last year I planted five artichoke plants out in the yard. The buds that developed were small and few and for some unknown reason (there must have been one) I let them flower. This year the plants are still there, but we've begun harvesting the buds and eating them. 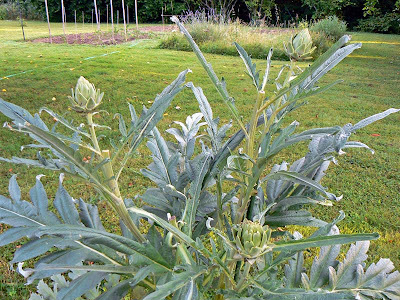 Two of the four artichoke plants. They're still rather small, not like the ones grown professionally. Either they're a different variety, or I'm not fertilizing, or they just don't like to be grown where we live. I wonder about that last one, though, because I see lots of artichokes in people's gardens around here. These are ready for picking! 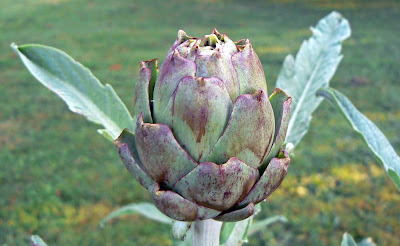 At any rate, our artichokes are edible. There's not much to eat, and they can be a bit tough, but they taste pretty good so far. 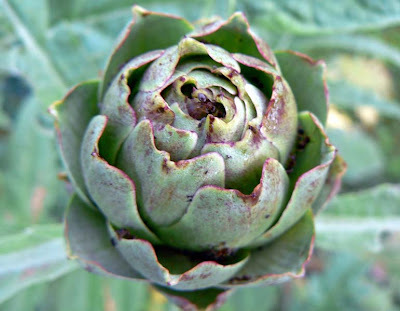 Our friend Chris pointed me to a website that tells you how to divide the rootstock to propagate the plants and continue the artichoke harvest. I have to look into that and decide if I'm going to give it a try. Close up of a bud, with a bee (or something) crawling in the middle. 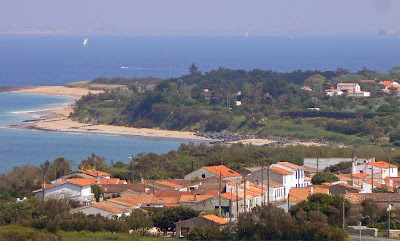 One day during our stay on the Ile d'Oléron in May, we ventured over to the sound-side of the island to see the big oyster ponds and a couple of the small towns over there. Our first stop was a small beach and port town called Boyardville. 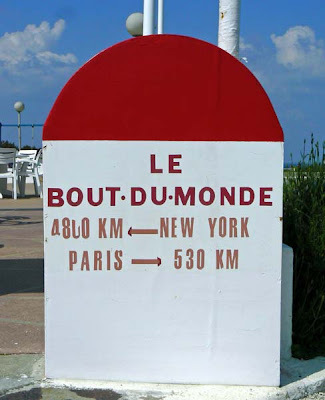 The sign for one of the tour companies that sails people around Fort Boyard and the island of Aix. 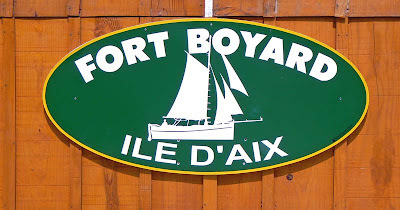 The town was named after the old fort in the channel called Fort Boyard, built on a sand bank during the early 19th century to protect a mainland arsenal from the English. The oval fort is quite an impressive sight as its sheer walls rise right up out of the water. 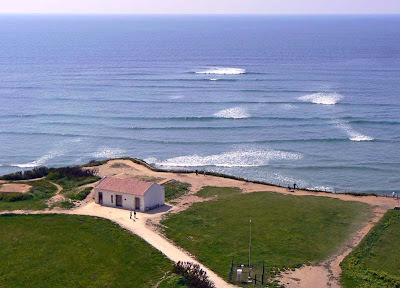 It was renovated in 1989 and has since been the site of a popular French reality/game t.v. show. Fort Boyard in the channel. We parked our car and took a walk, with Callie, around the small port and out onto the beach. There were quite a few people out strolling, boarding tour boats, and sunbathing. It was a very pretty day. 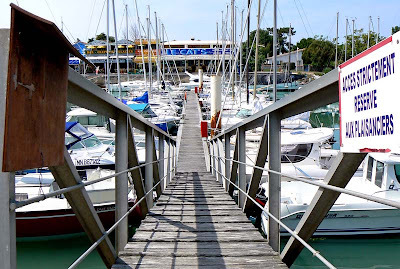 Pleasure boats in the port at Boyardville. Cheryl decided to forgo the beach walk in favor of doing a little shopping in town. So Ken and I walked the dog out to the beach and back, then we met up with Cheryl again and headed south toward the oyster ponds. 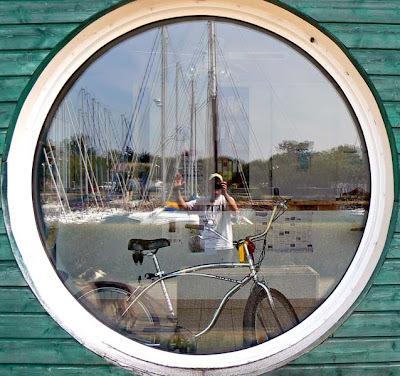 Self portrait with bike and masts. Or was it a whole meal? I can't remember. 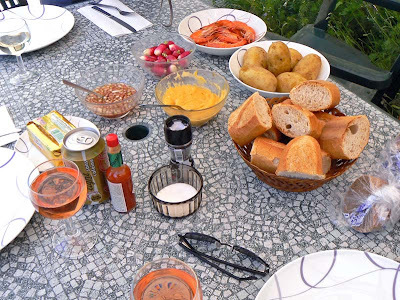 At any rate, we put this spread out on the table in the courtyard of our rental house on the Ile d'Oléron in May. Boy, was it tasty. The start of another great meal. There were radishes, cooked shrimp, and boiled potatoes. There was mayonnaise and mignonette sauce. The oysters came out after this picture was taken. We ate mass quantities. At the risk of being too frequent with the Callie photos, I offer this one. She was playing with Ken and the hose. He was using the hose to wash a rug on a recent hot day. Callie loves the hose. I took a movie of her snapping at the water as it came out of the hose. I'll get that processed and up here before too long. I thought I had killed the dog on Monday. Callie has this annoying habit of opening the lid on the kitchen garbage can and nosing around for goodies inside. We have resorted to putting a large rock on top of the lid so she can't get it open. Not elegant, but it works. It works, that is, if you remember to put the rock on top. Often, when working in the kitchen, I just leave the rock on the floor so that I don't have to keep taking it off when I want to toss something into the can. I forgot to replace it Monday morning. While at the computer, I heard a noise in the kitchen. I got up to look and, sure enough, Callie was in the garbage can. I looked in to see what she was looking for and noticed that I didn't see the used coffee filter full of grounds that I had tossed in there earlier. I panicked. I assumed that Callie had eaten the filter and the grounds and that she was going to die from a caffeine overdose. I grabbed her and took her outside and shoved my fingers down her throat in an attempt to make her throw up. I stuffed a handful of grass in her mouth which she just spit out (eating grass makes her vomit). All the while she had this bizarre look on her face. What is this crazy man doing?? I was nearly in tears thinking she'd die - Ken was in Paris with the car and I had no way to take her to the vet. She sat down for a nap and I paced around. Then I did what I should have done at first: I thought about what was happening. I looked in the kitchen and noticed that the floor around the garbage can was spotless. No bits of filter, no stray coffee grounds. 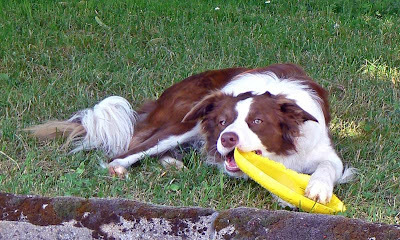 I looked into the dog's mouth and saw no traces of coffee grounds between her teeth. I looked back inside the garbage can and noticed that there was a coffee filter pressed down into the other stuff in there. Callie had pushed the filter down into the garbage while nosing around for something else. She didn't eat the coffee! She was going to live! Then I thought, I just had my fingers down my dog's throat trying to get her to barf. I'm going to kill her! Well, I didn't, and we all lived happily ever after. 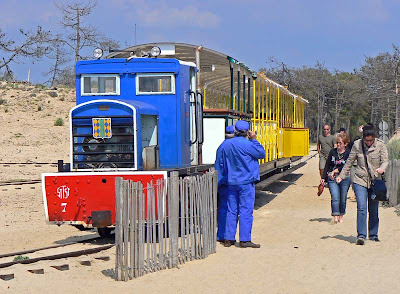 At Saint-Trojan on the Ile d'Oléron, there is a little tourist railroad that takes you from the edge of town out through the woods to the beach. The woods, mostly conifers, were planted in the early nineteenth century in an attempt to stabilize the sands. The original forest was pretty much decimated by human activity in the middle ages. The train stops at the beach for about 30 mins. before heading back. The beach is on the southern end of the island at the inlet between it and the mainland. The ride takes about thirty minutes each way. We got our tickets and caught the last train for the afternoon. The staff told us that we'd have a half-hour on the beach before the return trip. It was all a bit hokey, but we enjoyed it nonetheless. Callie came with us. She was quite nervous, but behaved incredibly well and stayed in a "down" during the entire ride. Then, of course, she got to romp around on the beach until we headed back. When it was time, she jumped right aboard as if she understood that we were going back. 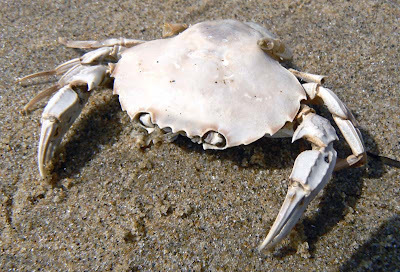 A bleached out crab shell on the beach. 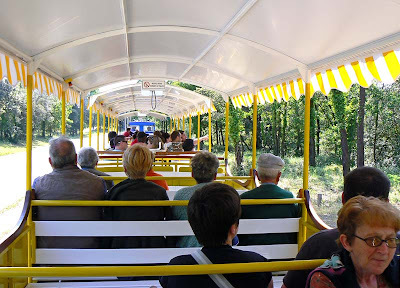 The little train, first opened in 1963, is run by people who are obviously train buffs. They really get into it. I'm sure many of them are retired cheminots (railroad employees) who do this for little or no compensation, just for the fun of it. 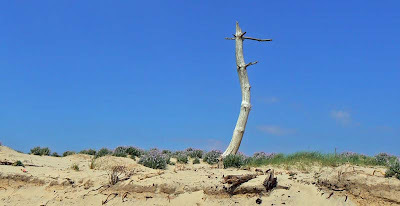 There were a lot of dead trees near the beach. For a while now I've been coveting a tart pan that I saw on Cuisine TV. It's a standard pan with a removable bottom, but it's long and narrow. It didn't come with the tart in it. While in Paris with Cheryl last month, I went to three kitchen stores over near les Halles to find one. I struck out at la Bovida and Mora, but Dehillerin didn't let me down. They had two kinds, one classic and one non-stick. I chose the non-stick pan and the price was right! A close-up of pan and tart. So, once back home, I had to test it out! Ken and CHM picked up some beautiful apricots while out one day. 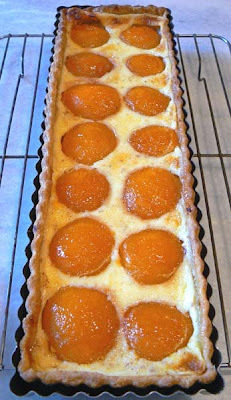 Naturally, I made an apricot tart. The pan worked wonderfully. The tart was tasty, too! First, make your favorite pâte brisée, or pie crust. Mine is here. Blind-bake it for about 15-20 minutes in a 190ºC oven. 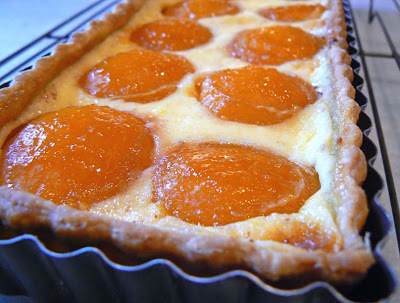 Use enough apricots to cover the surface of your crust when they're cut in half. An easy way to figure out how many to use is to place the whole apricots in a single layer in the pie pan (before you make the crust) and fill it up just halfway. Pit, peel, and halve the apricots. I do this by plunging them, about 4 or 5 at a time, into a pot of boiling water for 30 seconds, then into cold water to cool. The skins come right off and you can proceed from there. Beat the sugar into the egg first, then add the milk/cream little by little. Pour the custard into the pan so that it surrounds the fruit and bake in a pre-heated 200ºC oven for 20-25 minutes until the custard is set and lightly browned. During the last five minutes of baking, paint the fruit with an apricot or other fruit glaze. Let the tart cool before cutting and serving. My favorite activity while staying on the island was, of course, just hanging out. 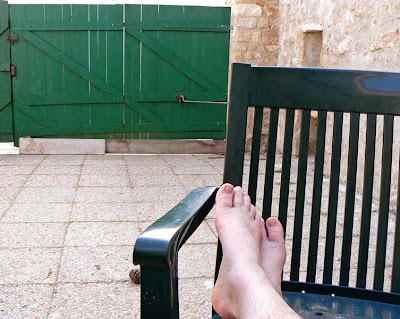 I put my feet up whenever I could and enjoyed doing nothing. Here I am with my feet up, enjoying the easy life. We had many sunny days and I just sat out in our little courtyard soaking it in. Unless, of course, I was able to soak it in on the terrace of a restaurant. What a life! 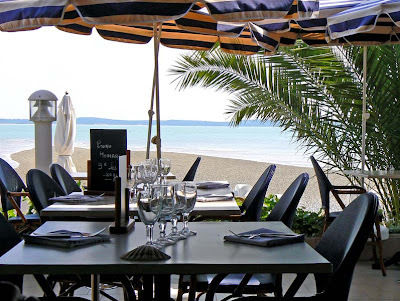 a great restaurant on the island. And many thanks to Cheryl, who treated us to a fine seafood meal as we watched the tide roll in from our table! 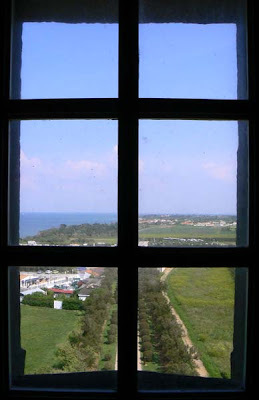 Here are a few of the great views we had from the lighthouse at Chassiron. There's really not much to say except to enjoy the view! Looking back toward the east and the parking lot. Sort of easterly, the sound with the mainland in the background. That's Fort Boyard on the right in the distance. 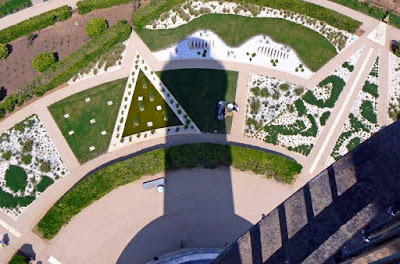 The shadow of the lighthouse. The gardens below traced the four cardinal points. Looking west, toward New York, and the waves coming in. 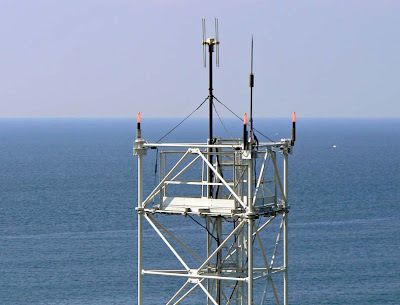 The top of a modern tower, just adjacent to the light. 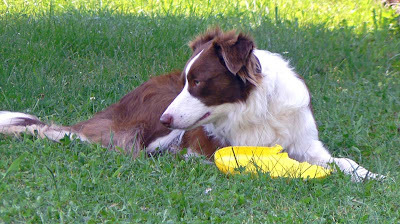 Callie just loves her frisbee. She loves it so much that she's in the process of chewing it to pieces. 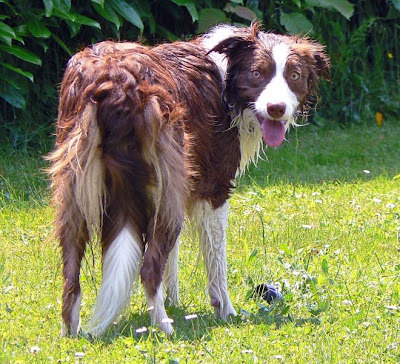 Callie's taken a hunk out of the frisbee. It's gotten to the point now that the thing is no longer aerodynamic. It won't fly. But she's still working on it. Here are a few close-ups from the around the lighthouse at Chassiron. The first is a shot of the lens. The lens sits inside a protective glass housing. 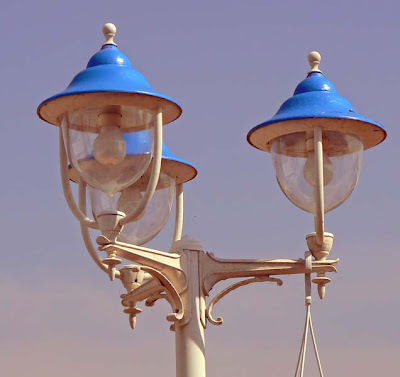 The light itself was electrified in 1930. From what I can tell, the first light was powered with vegetable oil in 1836 -- how's that for being green before your time. Around 1873 that fuel was replaced by mineral oil, followed by oil-gas* in 1895 and acetylene gas in 1902. Some smaller lights to help you find your way. There were also several different lenses used at Chassiron. 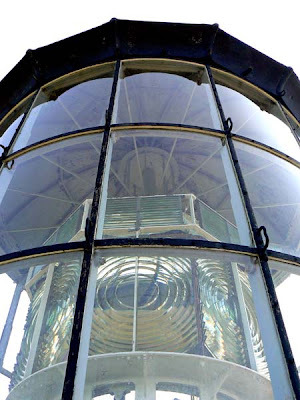 The current lens has eight panels, a 1500 watt halogen lamp, and can be seen from a distance of twenty-eight nautical miles. It says, "The edge of the world." The current lighthouse is the second to operate in this location. The original light, built in 1685, was a twenty-seven meter tall stone tower with an open-air charcoal fire lit at the top. I found this information on the French Ministry of Culture web site. *I don't know what oil-gas is. The French site calls it gaz d'huile. 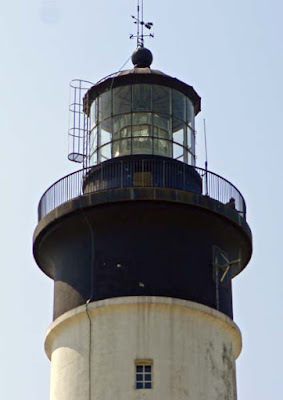 Among the coolest sights on the Ile d'Oléron is le phare de Chassiron, the lighthouse at Chassiron. 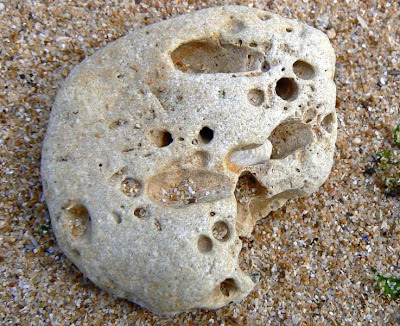 It's located at the northwestern tip of the island. A few hotels/restaurants/souvenir shops line the road up to the lighthouse. 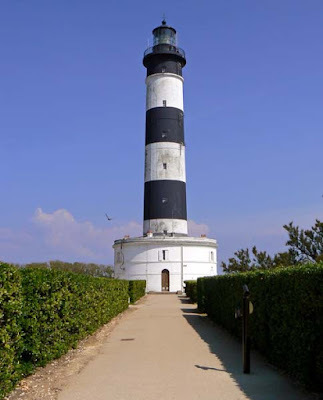 The lighthouse stands fifty meters tall (164 feet). It was built in 1836 and is by far the tallest thing around for miles. Or maybe I should say kilometers? The lighthouse is painted in black and white bands. Of course, it's a huge tourist destination and we were among the multitudes sucked in for a bit of fun. We had a terrific day weather wise, and since it was a weekday early in the season, there were fewer people than there might have been. Ken and I clambered up the 224 steps to the top while our friend Cheryl took Callie on a walk along the waterfront. Afterward, we met up again and did a little souvenir shopping and stopped for a refreshing pineau des Charentes in a café before getting back in the car for the short trip back to the gîte. A few of the 224 stairs on the way up. I had to stop to take a photo, and catch my breath. I've been to a few lighthouses over the years and this one is definitely up there among the best. It's a handsome building, the setting is perfect, and the views are great. 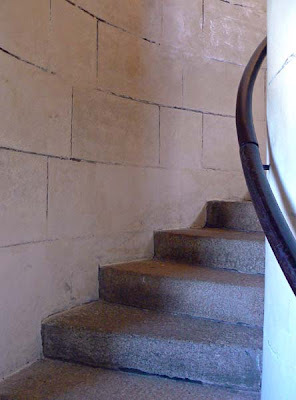 And it's not too hard to walk up! 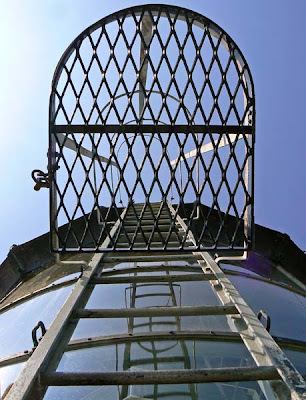 A view out one of the lighthouse windows. 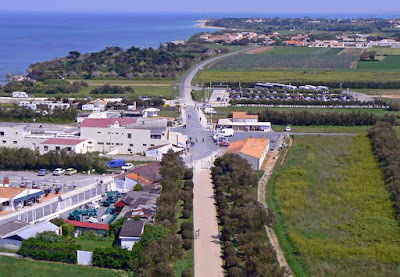 We stopped on the way at a wine co-op near the middle of the island to buy a few bottles. The owner of our rental house is a vintner and he had given us a coupon for 5% off whatever we purchased there. We were happy campers! A ladder leads up over the light to the roof. You might remember that, when we were on the Ile d'Oléron in May, the fishermen were on strike. That really put a damper on our food plans for the week. At least we thought it might. But we learned something interesting. Only the fisherman were on strike, not the people who raise oysters and dig for clams along the beaches. Consequently, oysters and clams were plentiful, and we ate our share. The finished dish. Lunch is served! 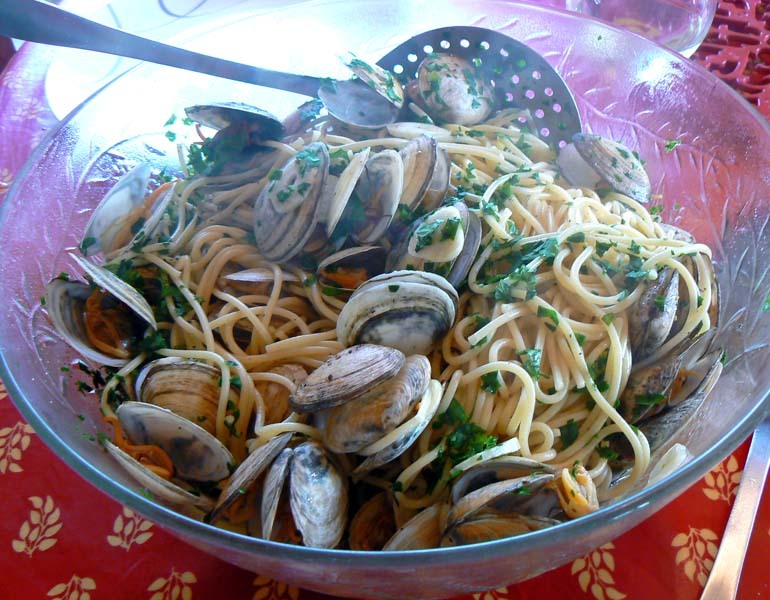 I had a real hankerin' for linguini with clam sauce, one of my favorite dishes. 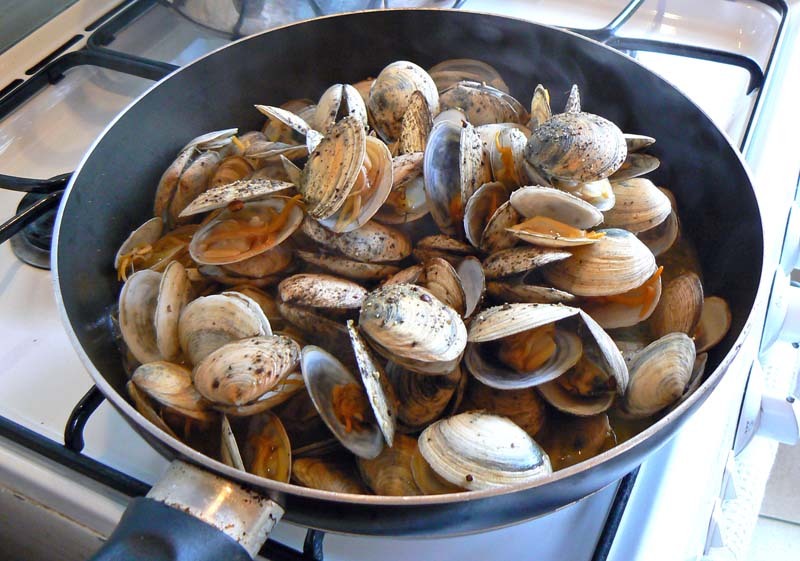 I figured that someone would have clams of one variety or another like praires or amandes. What I found was a vendor in La Cotinière who sold something she called lavagnons. 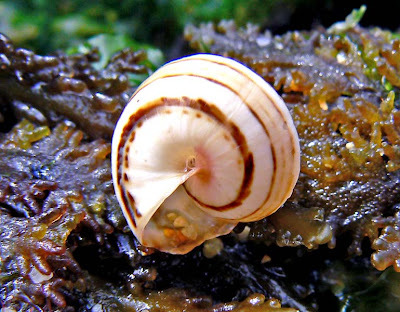 They're a local clam that is about the same size as a praire or an amande. I bought a bunch. We steamed them in white wine with shallots and garlic and served them in a big bowl of spaghetti. They were amazingly delicious. 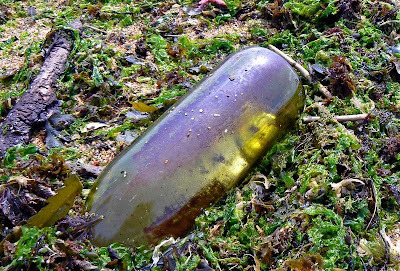 During our beach walks we saw lots of things along the sand. Sometimes the tide was high, sometimes it was low. During low tide Callie liked to chase the birds out into the surf. She'd come back all wet and salty. Once she caught a wave and body surfed back to shore. That was a sight to see. 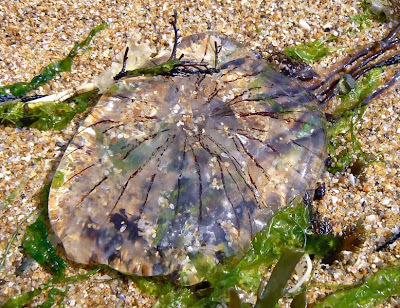 These are some of the things we saw while walking along the shore. Some are natural, some are the left-overs from people's activities. Whatever it was, it was mostly pretty. And not the stuff we're used to seeing in our little vineyard back home. We really enjoyed our walks on the beach. Callie was a bit leery at first, since she didn't really know where she was. But she quickly understood that on each walk we ended up at the beach where she could run off leash. This is from a few weeks ago when we were on the Ile d'Oléron with our friend Cheryl. 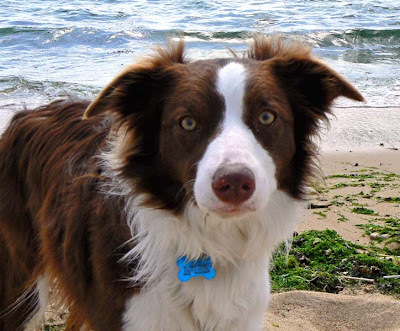 Callie enjoyed the beach, and we walked on the beach twice a day. This might be too much information, but she decided that the best place to "do her business" was right where the sand met the water. I figured that the tide took care of everything, and there were not really any people sunbathing or anything, so it was o.k. The Paris photos are done for now. I'm going to spend the next few posts on our May trip to the island. Get your straw hats and sandals ready!